At Minworth Junior and Infant School, we offer a curriculum that is broad, well-balanced and above all, engaging for the children that we teach. Learning is the core purpose of our school and as such is central to everything that happens within it. It is very much our intention that Minworth is the place 'where learning is alive!' both in the here and now, and in the promotion of life-long learning - the 21st century will demand learners who have a creative response to problems, be able to ask imaginative questions and be self motivated and resilient, both throughout education and the work place. In meeting the statutory requirements of the National Curriculum, we have designed a curriculum that integrates the acquiring of knowledge and understanding alongside the development of new skills in all subject areas, delivered through year-group specific half-termly topics, the detail of which can be explored in the table below. Equality is a key curriculum driver, both in terms of the 'who' and the 'what' we teach. Where children are concerned, we seek to ensure that our curriculum is inclusive and tailored to the needs and aptitudes of all children, irrespective of their background, culture or ability, enabling them to achieve their full potential. Equally, we endeavour to ensure equality amongst the subjects we teach, placing equal value on the learning within each one, recognising that the interests and successes experienced by children will vary with each child from subject to subject. Furthermore, all curriculum subjects are ably led and championed by key staff within the school, ensuring that we are constantly seeking to improve the experiences and opportunities we offer our children across the whole curriculum. In addition to academic learning, we believe children should also access the 'hidden curriculum', wherein they are taught to develop socially, morally, culturally and spiritually throughout the school environment, the values we promote and our expected standards of personal conduct. 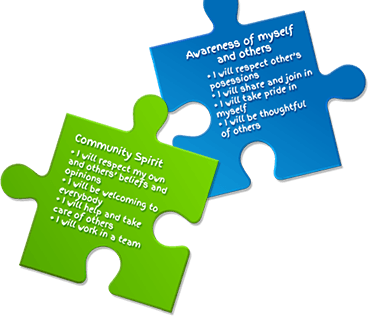 To ensure this happens, our Minworth Jigsaw values are taught, promoted and celebrated throughout our curriculum. Furthermore, we also promote the fundamental British values of democracy, the rule of law, individual liberty, mutual respect and tolerance of different faiths and beliefs. Please see the link below to see how these British values are promoted at Minworth. How are British Values promoted at Minworth? We believe that maths should be exciting, engaging and provide opportunity for children to develop their mastery of maths. In order to do this, we use and adapt the White Rose Mastery planning from Maths Hubs. 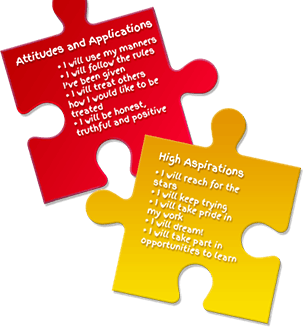 Throughout the year, pupils cover all areas of maths and are provided with opportunity to apply these skills through daily lessons. These lessons enable children to work on their fluency, reasoning and problem solving skills within a maths concept. Phonics is recommended as the first strategy that children should be taught, in helping them learn to read. It runs alongside other teaching methods, such as guided reading and shared reading, to help children develop all the other vital reading skills to hopefully give them a real love of reading. At Minworth Junior and Infant School we combine the guidance and phase progression from The Department for Education’s Letters and Sounds programme with the actions from Jolly Phonics. Children are assessed on their knowledge of phase one which identifies if a child can discriminate between different sounds, identify the initial and end sounds in words, blend sounds together and split words in to sounds. They are taught these skills continually throughout the year whilst being introduced to phase two, which is learning to hear a sound and knowing how to form it and recognise it in a systematic way by learning one set at a time. Once children are secure in these sounds they begin to learn the sounds in phase three. Phase three is taught in the same way as phase two, and by the end of phase three the children will know one way of writing each of the 44 phonemes. Children will consolidate the learning from reception and revisit any of the 44 phonemes that children may not be secure on before starting phase four. The main challenge in this phase is to help children to blend and segment words with adjacent consonants e.g. truck, help. As children develop in confidence they are introduced to phase five where children will learn alternative ways to write sounds and split digraphs. For example, they would already know ai as in rain, but now they will be introduced to ay as in day and a-e as in make. At the end of the year all children sit a national phonics screening test. Children will consolidate the learning from year one before moving on to phase six. This reinforces much of the learning from phase five and helps children to develop greater fluency in reading and begins to explore spelling rules and conventions, e.g. adding -ing and -ed. If children are assessed to require or need greater competency in phonics, they will continue to have support to learn the phonemes. Children who are secure up to phase six will learn the spelling strategies and common exception words for their age and year group. To support the school’s approach to phonics, the school has adopted the Bug Club Reading scheme. The children start on picture books until they are able to recognise and self-blend sounds. As children’s phonetic knowledge develops, they are able to move through the reading bands which provides opportunities to decode more complex words, develop an on-sight vocabulary and read with greater fluency whilst being challenged to develop their comprehension skills. Once children’s reading is secure they will become a ‘free reader’, choosing their own texts. Comprehension and reading strategies continue throughout the key stage two curriculum.